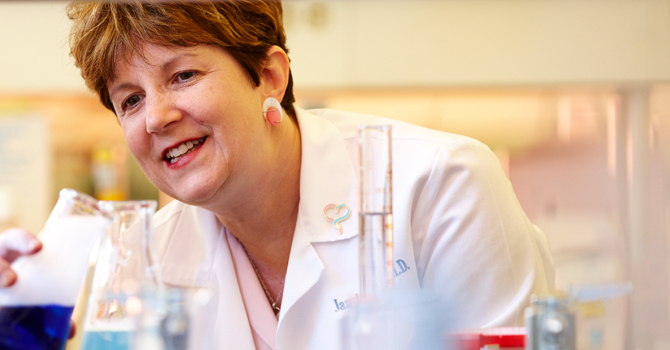 Dr. Janet Rader, Professor and Chair of the OBGYN Department, has great interest in the care of women and research. Dr. Rader has a dedicated space in the Human and Molecular Genetics Center (HMGC) to further her research along with scientists, PhDs, RNs, technicians and data analysts. Infection with high-risk human papillomavirus (HPV) is the primary cause of cervical cancer, but it is evident that additional factors must be involved, since only a small proportion of infected women develop cancer. The laboratory concentrates on identifying genes involved in the progression of cervical cancer through the analysis of molecular changes in preinvasive and invasive neoplasias of the cervix, in addition to identifying host genetic susceptibility polymorphisms in the progression of disease. Through a candidate gene approach that uses family-based controls, we identify inherited genetic polymorphisms and high-risk HPV subtypes/variants that contribute to the development of invasive cervical cancer and high-grade cervical intraepithelial neoplasia. The ongoing investigation is known as the Cervical Cancer Genetic Epidemiology (CerGE) study. We have DNA from cancer patients and family-based controls (trios), and have typed HPVs in tumors of affected women. To date, we have identified significant genetic polymorphisms in several candidate genes that associate with disease. Future goals are to accelerate the identification of polymorphisms important in the host susceptibility to cervical cancer utilizing high-throughput genotyping and candidate gene sequencing. We will identify the causal basis of the variants by interrogating matched cancer samples and functional assays. We want to understand why a small number of those exposed to HPV go on to get cancer. Women who have been treated for cervical cancer may be eligible for a current study on genetic susceptibility to that cancer. Exposure to the human papillomavirus (HPV) can lead to cervical cancer, but it doesn’t always. “We want to understand why a small number of those exposed to HPV go on to get cancer,” said Janet Rader, MD, a Medical College of Wisconsin gynecologic oncologist, chair of the Department of Obstetrics and Gynecology and the study’s principal investigator. The CerGE study, as it is called, has nothing to do with the patient’s treatment for cervical cancer. It is aimed at understanding both the HPV’s genetic variations and genetic variations in the patient that may cause cancer to develop in one person, but not another. As part of the study, Dr. Rader explained, the team also collects blood from the patient’s mother and father to examine which genetic variations the patient inherited and which variations they did not. The study’s results could help develop better testing for cervical cancer. Dr. Rader is especially interested in patients who have another first-degree relative — a mother or a sister — who also has been treated for cervical cancer. Please see more information on Dr. Rader’s lab. For information on the CerGE research study, please contact the research team at 1-855-771-9477 or Email Us.